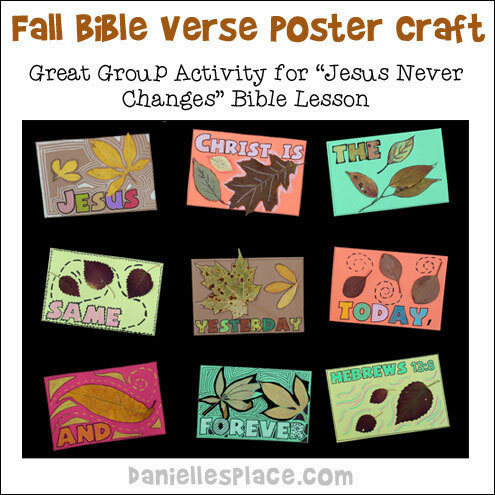 The following crafts and activities come from the Bible Lesson "Jesus Never Changes" available on The Resource Room and as an instant download. 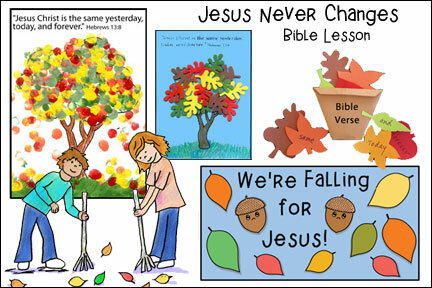 In this lesson children learn that sometimes changes are exciting and sometimes they're scary, but they can be comforted in knowing that no matter what happens Jesus never changes. He is the same yesterday, today, and forever. Dried Leaves - Collect fall leaves and place them in books between to sheets of waxed paper. Pile up books on top of the leaves and let dry for several weeks. 2. In class give each child one of the word sheets. Let them pick some leaves to glue to their papers and then decorate the word and the rest of the paper with markers and colored paper. 3. 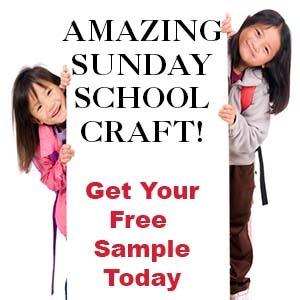 When all the children are done collect the papers and glue them to a poster board. 1. 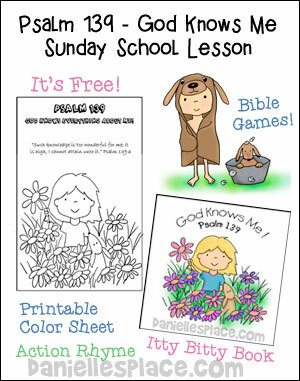 Before class print out the Bible Verse Activity Sheet and make copies. Collect leaves of different sizes and shapes. Patterns available to members and as an instant download above. 2. In class have your children place the leaves under the paper and use the side of crayon to rub over the leaves. When they are finished have them paint over the rubbings with watercolor paints. 7. Print out leaf shapes and use them to cut leaf shapes from fall-colored paper. Patterns available to members and as an instant download above. 8. 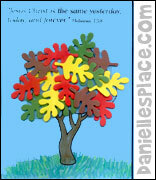 Have your children write one word of the Bible verse on each leaf and then place them in their paper baskets. Tell them to take them home and practice reading and placing the words in order to spell out the verse. 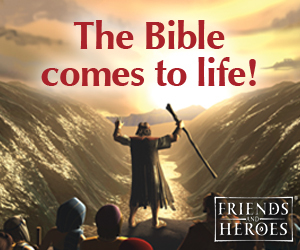 You can also play other Bible verse review game in class. Patterns available to members and as an instant download above. 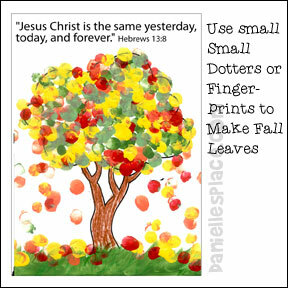 Have your children use finger paints, ink pads or dotters to make leaves on the trees and on the ground. Collect fall leaves and sort them by color. Let them dry out and then crumple them up into small pieces. Keep the colors separate. In class the children can put glue all over their tree and spots of glue below the tree. Sprinkle the dried leaf pieces over the glue like glitter to make a pretty tree. You can buy small fun foam leaf shapes at a craft store and have the children glue them to the tree. Or you can use real dried leaves. Staple leaves and acorns shapes cut from construction paper to a bulletin board with a blue background. Leaf shapes, acorn shapes, and words are available on The Resource Room. Buy precut, leaf shapes or cut them out yourself. 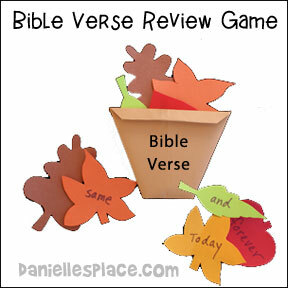 Write the Bible verse, one word per leaf, making a set for each child in your class. Have the children sit in a circle. Throw the leaves up in the air and let them fall all over the place. You can also have the children hold hands and move around in a circle as you sing the first part of the "Leaves" song below. Each time they sing a round, throw up some more leaves. Keep singing it until all the leaves are on the floor. 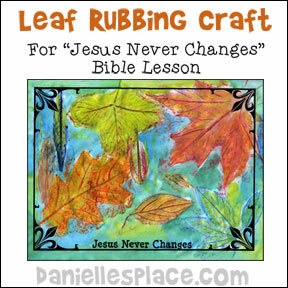 Have the children pick up the leaves and put the Bible verse together. 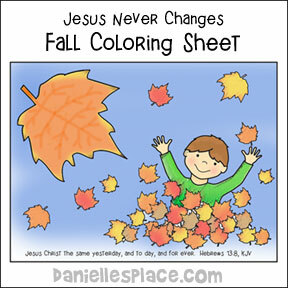 If you have very young children who cannot read use only three words such as "Jesus never changes". Or you can put each word on a different color of leaf and have them find one of each color and then help them put them in order. This game goes with the Bible Lesson "Jesus Never Changes" on The Resource Room, above. 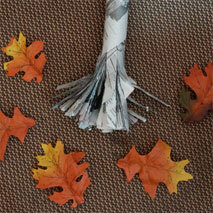 Preparation: Make newspaper rakes, and cut leaves shapes from colored paper in fall colors. 1. Spread out a bunch paper leaves on the floor. (You can use the ones from the review game above). a broom. Go to the Fall Crafts Page for directions on how to make the rakes. 3. Give each child a rake. 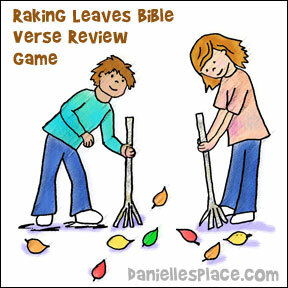 On the word go the children should try to rake the leaves into the baskets using their rakes. The team with the most leaves in their basket wins. If you have preschool children just let the children practice raking the leaves into the basket.